Seattle Seahawks Helmet Deluxe Replica w/decal Full Size 2012-Present by Riddell | Sports Memorabilia! 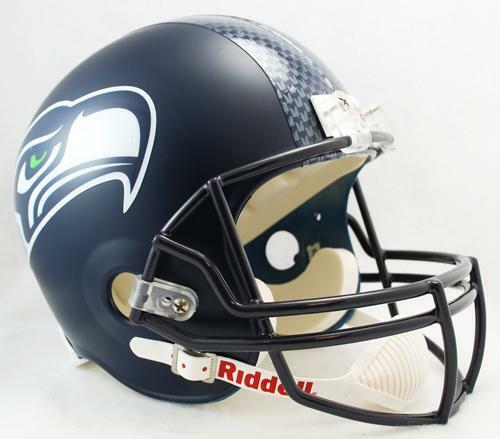 This current Seahawks Replica Deluxe Full Size Helmet has the standard replica shell mold of the other NFL helmets. The satin navy shell and the top area decals replicate the on-field look of the current Seahawks helmets used on the field. Please note that the helmets used on the field for the Seahawks are all Speed helmets with the HydroFX finish, but this speed mold is not available for replica helmets. The common round mold is used. In regards to the decoration the top striping decals are designed to look like the HydroFX finish on the real Speed helmets. This extra decal feature has an upcharge to the normal price of other NFL Replica Deluxe Full Size Helmets.